On March 10, 1949, two Israeli brigades Negev and Golani converged on the police station of Umm Rash Rash on the Red Sea, now known as the resort city of Eilat, and occupied it without firing a shot. This act completed the occupation of the Negev Desert, allocated to their government by the United Nations partition plan and was the last operation of Israel's War of Independence. However none of the soldiers had remembered to bring a flag with them, so a soldier by the name of Micha Peri hand drew one by pouring blue ink on a sheet. 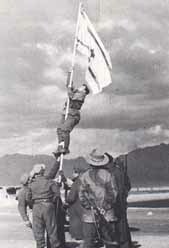 The result was apparently a kosher Israeli national flag with one exception  Peri appears to have smeared the Shield of David device, and filled it in entirely [as on this 1947 flag proposal]. This design was never used again. The flag is known as the Ink Flag. I found a good picture of it at the Eilat website. The name of the police station was Umm Reshrash, and it was standing just where the city mall is today.